This ProCom Vent-Free Garage Heater is designed specifically for the garage setting. It has 30,000 BTU that heats up to 1,000 square feet. 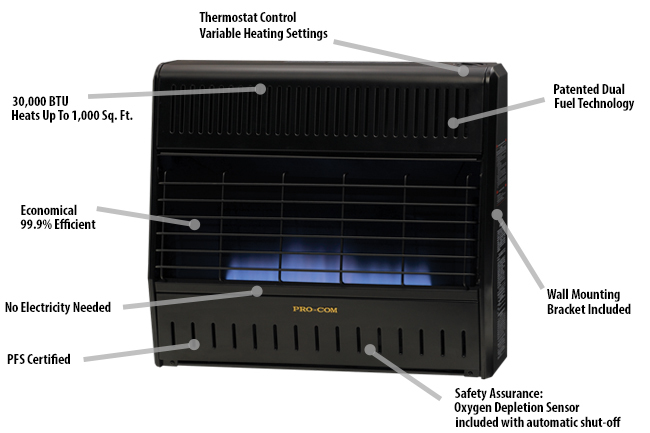 This efficient gas space heater does not require an outside duct, chimney, or even electricity! Ideal for normal home usage and any emergencies, these heaters can go right into your garage to offer you a great source of dependable heat.